Want to beat the heat? Now you can with the Blue Castle Water Wave Inflatable Bounce House Combo. 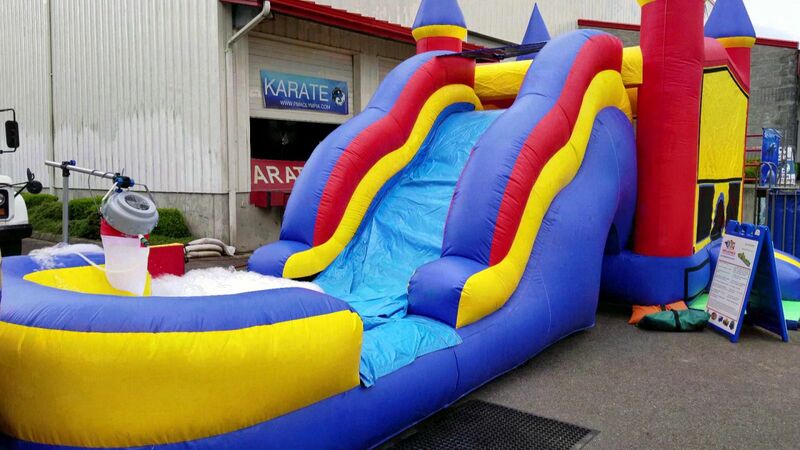 This 15' Water Slide and Bounce House Combo will be sure to keep you and your guests cool while having fun. Now who can pass up this Inflatable Water Slide Combo? Be sure to take a look at our concession machine rentals. This castle bounce house and water slide combo is a great way to keep the kids busy while combining fun and healthy activity. Want even more fun add a foam machine rental and fill the pool with foam! The King or Queen for the day can preside over their royal court and all their friends in this Castle themed bounce house! Room to jump, climb the ladder, and go down the water slide, and so much more!! There's no better place for fun in the sun than in the beautiful castle themed bounce house & waterslide combo! !